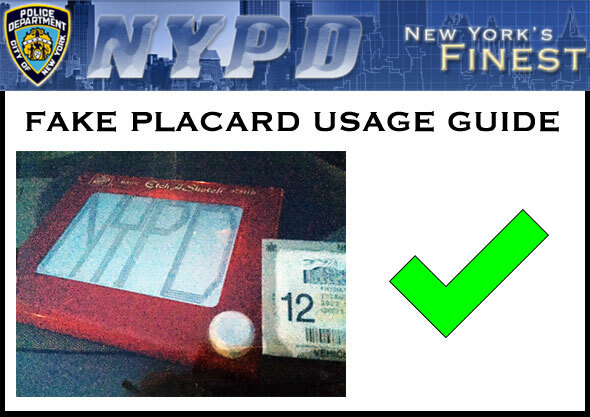 Standing outside 1 Police Plaza this morning, Police Commissioner Bill Bratton and Mayor Bill de Blasio announced a sweeping expansion of New York City’s fake parking placard program. This “Amtrak Police Surgeon” parks anywhere for free. The problem with the current fake parking placard regime, said Bratton, is that “there are no rules” and “it’s a total free-for-all.” He wants to get a handle on the situation by issuing clear and consistent guidelines on the use of fake parking placards that all New Yorkers can follow. I was buying this until the bit about the New Jersey Devils. There’s no way they’d honor a Devils logo. The Etch-a-Sketch is a sweet touch. Next up: Bratton issues helpful guidelines on how to exonerate killer drivers regardless of the circumstances. A few months ago I saw two UPS trucks parked back-to-back on one side of 23rd Street, swapping packages. That was a clever parking job there! The etch-a-sketch, LOL. Good knob control. I should have picked a more generic piece of mail to scribble on. 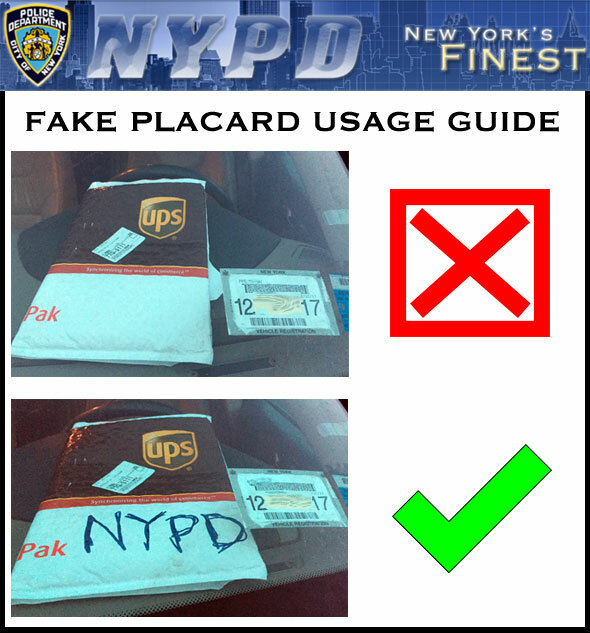 The association with UPS illegal parking/stipulated fine program was unintentional. 1. They’re doing placard reform!?! That’s awesome! 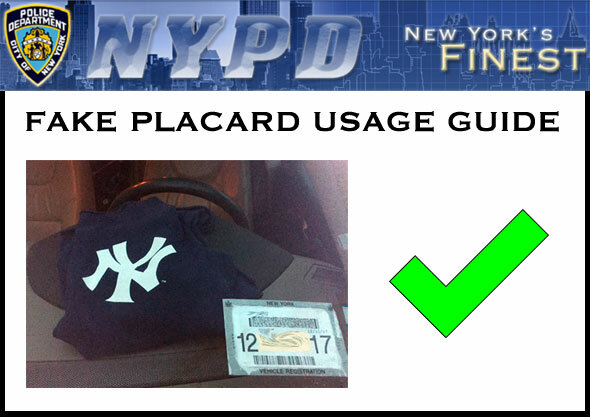 Must go congratulate @placardabuse on twitter! 2. Oh wait…it’s April 1. This would be even funnier if it weren’t the NYPD’s actual practice. Brilliant! But you forgot another acceptable fake placard — a press credential on the dashboard for members of the press who love free parking but are too lazy to get a press plate. Good point. I frequently see UPS, FedEx, and USPS parked on the sidewalk next to a sign that says “No parking on sidewalk”. A sign should not even be necessary, but it’s clearly not enough. The City Council wants to track placard abuse so it can evaluate the extent of the problem. NYPD refuses to help. On Thursday, the de Blasio administration will release details of its long-awaited effort to curb placard abuse. Don't get your hopes up. Mayor de Blasio announced plans today to "crack down" on rampant parking placard abuse, one week after his administration granted tens of thousands of new placards to school employees. Mayor de Blasio's forthcoming congestion plan won't call for traffic pricing, but the mayor has plenty of other options to reduce traffic congestion. Here are four policies that would provide much-needed congestion relief on NYC streets -- it's difficult to imagine any City Hall traffic reduction initiative that doesn't include some of these ideas. The situation at the Inwood crosswalk shows how the placard system is directly at odds with DOT safety projects.